The Up Drill for the rifle is what the 3 to 4 drill is to the pistol. This drill is the base for everything that happens with a long gun. 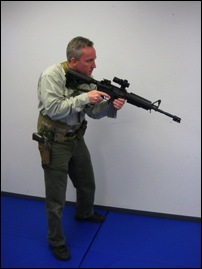 This may seem like a silly drill to practice, but it can be performed in conjunction with any of the other rifle skills. Key Points of the UP DRILL: These points are in order of importance, not performance. It is of the utmost importance to practice good safety manipulation. There are people out there that roll around "hot." Switching the selector lever over to Fire when action is expected and then leaving it in that condition until the situation has been resolved. This is a bad practice. If the weapon needs to be slung in the course of whatever you are doing, your equipment can induce an accidental discharge. 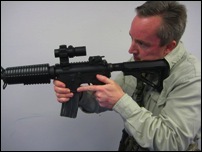 If the shooter's hand is on the pistol grip a finger or thumb must be on the safety. The weapon comes up and off Safe at the same time. The weapon is lowered and returned to safe at the same time. This should become habit. Once ingrained, the skill will become natural; you will never have to question yourself or the weapon. 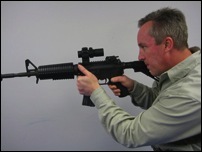 The trigger finger stays out of the trigger well until the weapon is ready to fire. 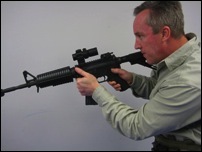 If optics are involved, this drill will show you if the sight is positioned properly for eye relief. The shooter should be squared to the target. If wearing body armor, put that plate where it will do the most good. Elbows should be tucked in, providing skeletal support instead of extra burden to the arms. Remember, use a good fighting stance, weight forward. If you fire a multiple round engagement, the weapon will push you back if your weight is on your heels. Practice the UP Drill from both a low and high ready position. High Ready is with the gun up, looking over but not through, the sights or optic. 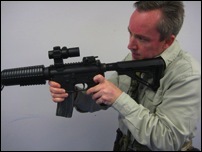 Low Ready is at a lower more comfortable position, with the sights or optics well clear of the field of view.